Sometimes you just need a break, a refresher, a few days to recharge your batteries. With just a few days away, I have come back with a new outlook on life, I feel happier and I'm ready to start my losing weight journey. I feel optimistic with so many fresh new ideas. 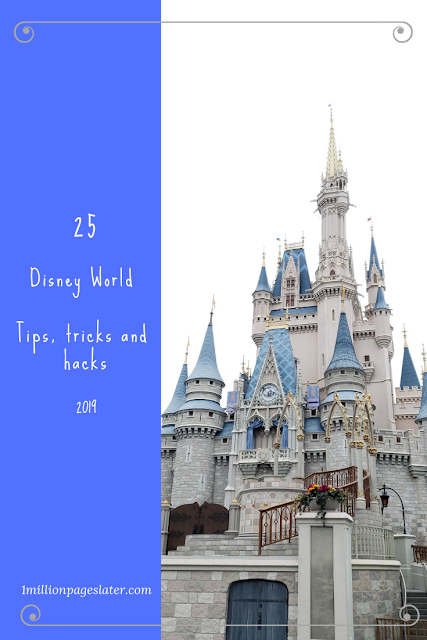 And I have come back with a bunch of new blog post ideas about Universal Studios. What can I say I feel inspired from my weekend getaway. 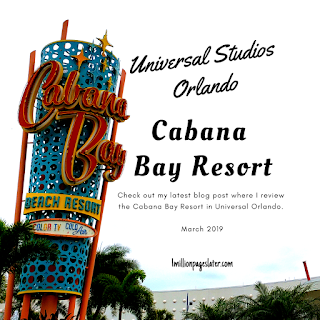 We just got back from a two night stay at the Universal Studios Orlando Cabana Bay Resort. Late Friday night we drove up to the Cabana Bay. It was nearing 11 pm. The lobby was bustling, there was live music and there was a decent line to check in. My boyfriend stood in line to check us in as I ran to the restroom. Let me tell you that was the nicest smelling restroom I've ever smelt. It was just a pleasant aroma. And the restrooms were super clean. I was impressed. I met my boyfriend in line. The line moved fast. We weren't in line long at all. Check in only took a few minutes. We received a map, two room plastic card keys and we are on our way. We stop to see the pool area at night. It was very pretty. Not super well lit but sery romantic vibes at night. The pool area was deserted as we learned the pool closes at 11 pm. As we head back to our car we stopped at the gift shop. We can't resist a late night Universal Studios gift shop. There were TONS of Harry Potter stuff which is nice. We are really into our Hufflepuff (me) and Slytherin (him) personas. That's Harry Potter lingo for those muggles out there. Now we are finally off to the hotel. We hopped in the car, drove around the round about, just as the check in lady told us. We hit a slight snag at the gate to enter the parking lot. The key card wouldn't open the gate. A few attempts later, we push the "Call for Assistance" button and we are buzzed in. Slight snag. No biggie. For a Cabana Bay newbie, the parking situation is confusing. We found our building alright, we just weren't sure where our hotel room was located (left side of the building or right side). We wanted to park as closed to the hotel room as possible. We ended up at the other end of the building but it all worked out just fine. It wasn't too far. We lived and we parked. Lol. The parking lot also didn't have a lot of available spaces. Which was a little scary. We found our room alright. The signs were odd. The signs pointed us a long way around. Again, no biggie, just odd. Two words. Lazy. River. Let me start by stating I had never been on a lazy river before. I know, I know. I didn't know what I was missing. It just so happens that the Cabana Bay Resort has a lazy river on premise. Wow. I never want a pool again. I just want the Lazy River life. That's all. It was amazing. So relaxing. Very fun. Just a constant flow pushing you through a loop. We just hung out there for a couple of hours. That was nice. Also, the pool area offers you to purchase inflatable pool tubes in all sorts of sizes (kiddie and larger people) lol. I love how inclusive they are. One of the other perks of staying at a Universal Studios on premise hotel is the bus service to and from your hotel to Universal Studios, Volcano Bay and City Walk. It's free. The buses were fast. We only waited for 1 bus our entire weekend trip. My only gripe about the buses was the seats on the bus aren't fat friendly. They are tight for the larger people. Both me and my boyfriend are big people and we sat on two seats that had bars on the ends. My hip fat molded the bar and engulfed the metal. It was uncomfortable. With all that being said, I loved my stay at the Universal Studios Cabana Bay Resort. I would stay there again. And I plan too. On our next Universal Studios adventure we plan to stay at the new Aventura Resort. 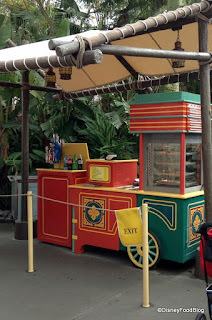 Like, share and subscribe as I plan to share more blogs about my latest Universal Studios mini vacation soon.